These are both a client favorite, and a personal favorite. 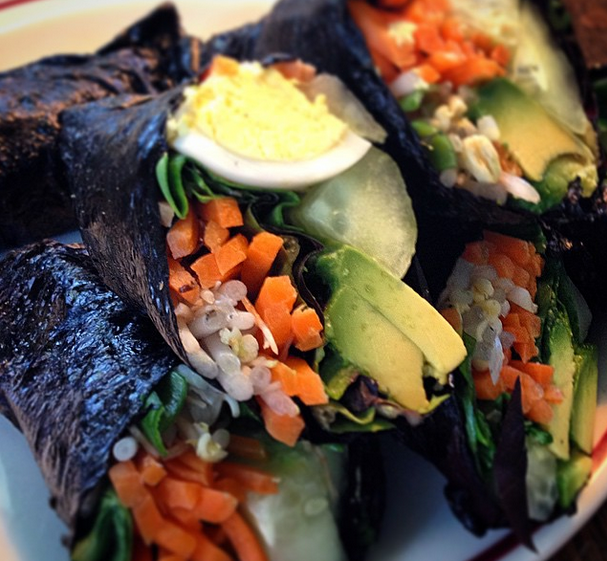 Nori rolls are so easy to make, and you can fill them with anything you like – vegetables, tuna salad, grilled fish, or egg. Best of all, they’re filling! I am ALWAYS hungry, but when I eat these, I find I’m satisfied for hours which is rare. Purchase organic nori sheets at Whole Foods or Fresh Market. Place sheet in front of you, turned to look like a diamond instead of a square. Put filling in center. Roll as you would a burrito, tucking in the ends, dab a few drops of water or soy as you get to the end and it will seal. The moisture from your filling with naturally soften the sheet pretty quickly, so you don’t need to “wet” the sheet. Can be cut in half on a bias. Enjoy!